Can you be merely "influenced" by God? Many religions struggle with the concept of a god that is so omniscient, it knows the future. This sometimes is described as being eternal, existing outside of time. The problem is the conflict between this, and free will. I find the two to be contradictory, especially when it comes to the concept found in many Christian sects that free will is most important with respect to your choice about whether to believe in god or not, or whether to be good or evil. The religions say you were created by god, who knew what choices you would make before creating you, but you are also punished for those choices. Even though, if asked, "can I choose another future than the one god knows I will choose, making him wrong?" they will say no. However, the religious often do not see the same contradiction. We will not resolve this conflict here. I want to address the more direct question of a god who talks to people, and intervenes directly in the mortal world, as Gog does. Gog appears in the minds of Baltar and many other characters. Gog also directly affects physical events, doing things like returning Starbuck in a new Viper. Read more about Can you be merely "influenced" by God? The prequel series, Caprica, is now available on DVD and for download. Caprica is set 56 years before the first Cylon war, and deals with the origin of the metal Cylons. This meta review provides links to some of the recent low-spoiler reviews. As you will read in all of them, Caprica is very different in tone from BSG. It's a drama set on a planet, not a space opera. My disappointment with how BSG was ended lowered my expectations for Caprica, which is of course a good thing. You always enjoy a work more when you go into it with lower expectations. In an ideal world, one would wish for a way to get great recommendations on worthwhile things that don't raise high expectations -- you would enjoy life more. It was the high expectations I put on BSG that in part led to the ending being such a letdown. However, the overall review is positive. 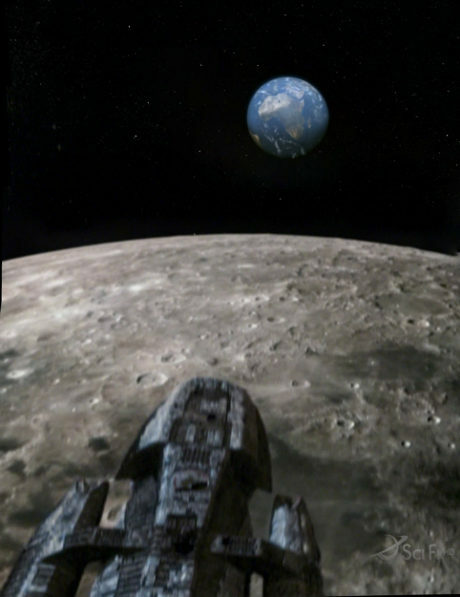 If you did not know it was Battlestar, you could treat Caprica as near-future SF set on Earth. If you didn't have the references to polytheistic religion, in fact, a viewer would be hard pressed to spot differences from a typical tv-SF depiction of a decade or two in the future. Of course, the religion is important in this show, as it became important in BSG. While the God of Galactica (Gog) does not show it's face directly, we must wonder if it will do so later. However, the religion is fundamental to the plot in that many of the characters do very dramatic things motivated by their religious beliefs. Which is perfectly fine, of course -- some people mistook my criticism of the presence of an interventionist god in BSG as criticism of religion playing a role in a story. You will get some items from Caprica that help explain important elements of BSG. They are more subtle than normal, but there. So the verdict is to watch it, though you will also do fine waiting the 8 months for it to appear on the air. The DVD version contains a bunch of mostly lesbian makeout scenes which won't show on TV; presumably they are there to keep the boys titillated. They occur -- no spoiler here, as you see this in the first 2 minutes of the show -- in a virtual reality club which is the setting for a number of scenes in the show. It may be a bit surprising at first to see the Capricans using technology far beyond what is seen on BSG when it comes to computers and robotics. Obviously the colonies had a minor Butlerian jihad after the Cylon war. This was hinted at several times during the BSG series. As is obvious to any reader here, I was quite disappointed with the god-did-it ending of BSG. However, we'll need to examine this god a bit more because in some way, it's the only other character, besides Young Bill Adama, who we will see in the upcoming Caprica series. The god appears to some extent, as an underground monotheist cult exists and 2 of the 3 initial Cylons are patterned after its members. It has to be assumed it is from here the Cylons got their own monotheist religion. Read more about What is most meaningful? Don't keep secrets when "It's the Characters, Stupid"
Moore famously declared, when composing the end of the BSG story, that "It's the Characters, Stupid." He wanted to focus on what happened to the characters and their story, and the plot and mysteries took second place. I can understand that philosophy in writing. However, I do believe that if this was truly the case, the right thing to do is not create giant mysteries for the audience. Read more about Don't keep secrets when "It's the Characters, Stupid"
Kevin Grazier apologizes for Tomb of Athena, etc. Read more about Kevin Grazier apologizes for Tomb of Athena, etc. Readers of this blog won't have to guess my disappointment with the 2nd half of the finale. And yes, I will tear apart how silly, and pointless the way Moore wanted to end it was. Posts on episode-day usually get quickly overtaken by the new episode, so I am holding off some general articles I have for post-show. But with 3 hours to go, I thought I would open up speculation on two topics I haven't gotten a large read on. These are the Opera House and All along the Watchtower. I've read much speculation about both. Could they really live together? We've been told since season one that "god's plan" is to unite the Cylons and humans, in particular through a hybrid race in Hera. The Final Five can breed with the 7, and I suspect with the humans, but I suspect the Final Five will all die, their race entirely wiped out. Read more about Could they really live together? In the first part of Daybreak, we are told that the Colony is in the accretion disk (a reasonably close orbit) of a naked singularity. Naked singularities are an unsettled question in physics. Some don't think they can exist, others say they can. Here is an explanation from Scientific American written from the pro side.